Recognizing symptoms and learning how to talk to your doctor are the first steps towards treatment. Understanding Lyme Disease is the best way to prevent, diagnose and treat it. 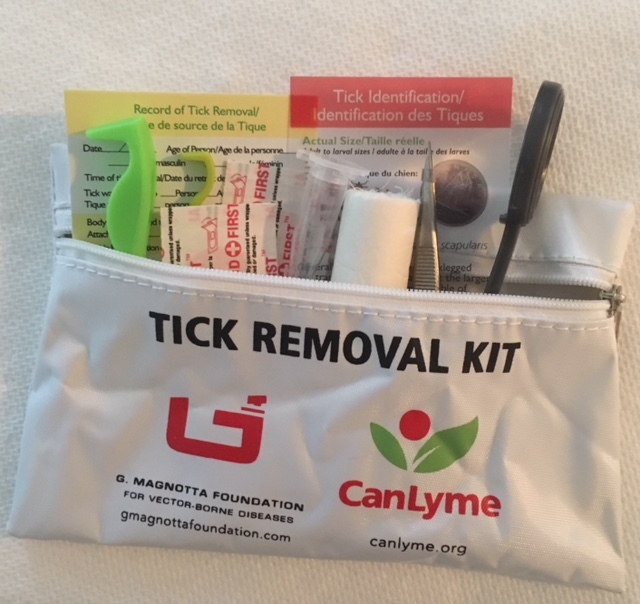 Order your TICK REMOVAL KIT, for your first-aid kit, or glove box, with tick identification cards, 3 styles of tick removers (ie, if tick is in your ear or a pet’s ear a different tick remover size and style are required), magnifying glass, container to put tick into, instructions for proper tick removal, etc. Why Donate to CanLyme? Click Here. Visit the Canadian Lyme Consortium website. Watch Ottawa conference on Lyme disease – 33 videos. Lyme disease is on the rise in Canada, yet diagnostics, treatment, physician and public awareness are largely inadequate. The Canadian Lyme Disease Foundation (CanLyme) is dedicated to raising awareness and promoting Lyme Disease research, education and treatment. See our CanLyme Venture Grants Policy available to medical/science research students and investigators. Watch W5 TV episodes on Lyme Part 1 Part 2 CBC radio, excellent interview with Dr. Peter Lin on Lyme disease. Listen here. Watch all the presenters at the 2013 Lyme Disease Think Tank, Vancouver, BC, Canada This US HHS webinar will highlight the state of research on persistence of Borrelia burgdorferi. Please join us… Buffalo Point, Manitoba proactive in Lyme awareness and fundraising. Please join us Buffalo Point, Manitoba proactive in Lyme awareness and fundraising. You must check your pets paws for ticks! !